Two more of the dwarf slayers painted. Officially one of these is a daemon slayer, but let's not split hairs. The blonde figure is possibly my favourite sculpt of the regiment, for a long time it sat in a box with a few other figures and was destined to be part of a Mordheim band of adventurers. So it's good to finally get some paint on the old thing. The orange haired figure was part of an army I picked up on a forum sale last year - painted within a year is pretty good going. I seem to be struggling to get some quality time with my dwarfs at the moment, I have quite a lot of commission work which leaves me little time for my own figures. So progress is very slow, even for dwarfs. Still, two down, two more to do (plus a unit filler). 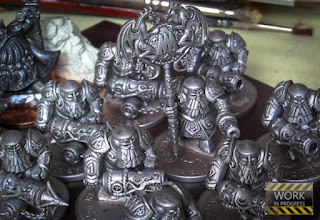 Hopefully my next dwarf regiment will be much quicker, I would like to have a playable contingent by the end of May. 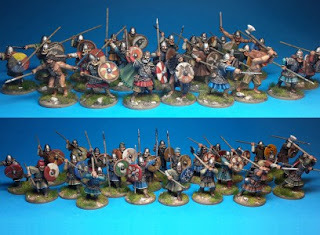 Last week I took advantage of the offer by Saxon Miniatures - two starter warbands for £60 plus postage - full details on their website or here in this post. The parcel arrived today. The vikings are for a friend, but I took a couple of photos before I hand them over. Here they are lined up with some of my vikings, all these figures are metal unless noted. Scale wise and stylistically they match pretty well with the old Gripping Beast - not surprising as I think they are the same sculptor. 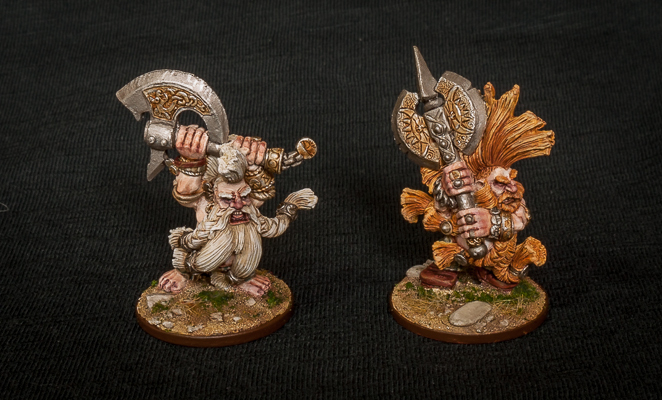 They also fit in well with my Drabant Miniatures vikings, though the latter are slightly more detailed. A good thing if you ask me, though I know some gamers prefer the simpler styles. It should be noted that shields and weapons are included, not something that all manufacturers do (for what reason I have never discovered - imagine buying a car and having to fit your own tyres)! If you take advantage of the warband offer you get a sheet of shield decals thrown in too. I would be happy to include these in my collection, but the vikings are off to a new owner, the Saxons are for me. This last photo shows the Saxons (Danes) alongside my existing Saxons. Apart from the Tanatus metal archers, all my Saxons are plastics from Gripping Beast and Wargames Factory - the latter are not shown because they are just bad models and I would not recommend them. Stylistically, the Tanatus archers are slimmer and more finely detailed, not something that bothers me on the battlefield when these things are barely noticeable. 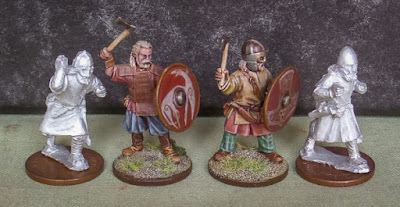 The Saxon Miniatures again fit in well with the Gripping Beast plastics, particularly the fully armoured figures which are, for my money, the best of their plastic range. I am less keen on the plastic unarmoured figures available, which is one reason why I bought these metals. In general, I am a fan of plastics, but some of the historical sculpts are poor. Hopefully I won't have too much trouble with the claw hands, the bane of metals as far as I am concerned. A fuller review to come when I have assembled and maybe painted a few samples. The dwarfs are slowly, implacably, marching forwards. With the rangers finished and the troll slayers well under way, I wanted to put together the next unit. Originally, I was going to stick with my old method of building core units first, but there's no real need to do that now. Another big obstacle on core troops - I just cannot find any that I particularly like, so will have to kitbash some. That requires a lot more planning and a lot more effort, I wanted something that would be easy to get together and quick to complete. Then I saw the trailer video for the Irondrakes on the Total Warhammer page and my mind was made up for me. The regiment is at a very early stage in the above photo. Base coated with car spray (! ), washed and then drybrushed, for a lovely shiney armour look. The detail on these figures is very impressive, the scrolls and runes on the armour and the chainmail is really well done. What you cannot see, unless you hold them in your hand, is the very fine filigree design on the plate armour. Lovely stuff, and on flat plastic models that some hate so much! It's a shame there's not much variety in the posing, but I suppose there are not that many ways to fire a gun that weighs as much as a small cannon. There's twelve figures in the unit to make them playable in Dragon Rampant - a couple of unit fillers at the back that will double as extra characters or terrain in other games. When they are finished they will look something like this artwork, though not quite as dull - I want the enemy to be dazzled as well as frazzled. Saxon Miniatures have a spring deal promotion running. Two warbands, one viking and one Anglo-Dane, for £60. This is a 10% saving on the usual warband deal, and there's a free set of shield transfers too. Check out the deal here, but be aware it's for a limited period only. This would be an ideal purchase for anyone who has been wanting to try Saga, as each warband is a four paint starter force for that game - one warlord, two hearthguard units and two warrior units. I am splitting the deal with a mate, I already have quite a few vikings so I will be taking the Anglo-Danes, which can also double as Saxons. They will replace my (frankly) awful plastic Wargames Factory troops which I bought when taking my first tentative steps in the game. I also have an idea for a fantasy style game, pitching the Anglo-Danes against my undead dark age warriors, probably using Dragon Rampant rules, or possibly Fantastic Saga. But that's leaping ahead, first I have to get them painted up - and I am determined to get them ready sooner rather than later. They have to join in a packed schedule alongside Dwarfs, Orks and my secret Steampunk project - it's a good job the days are getting longer. Today seems like a good day to talk about a foolish thing. Over the winter period I went through a lull in painting and gaming, but I didn't abandon the hobby completely. One of my xmas gifts was a copy of Fanticide, a fantasy skirmish set of rules. There's a few things I like about the book, but the background is not really one them. So I started dreaming up my own armies to slot into the world, then had the really foolish idea of creating my own world and background. One thing lead to another and I ended up drawing this map. 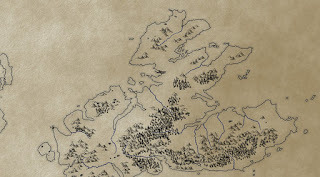 You might be thinking, "well that's not that foolish, I have drawn dozens of maps for campaigns and ideas of my own". But this was drawn in GIMP, a drawing package, of which I had zero experience. In fact, I downloaded the free version, wrestled with a few tutorials and then stumbled through as best I could. I must have spent about 10 or 12 hours producing this thing. And it's not even finished. I got to this stage and decided that it was too detailed, it doesn't convey the land features well enough. Theoretically I can return to it in the future, it's drawn in layers which can be deleted or modified, but it's been a few months and I have forgotten most of the knowledge I learned - use it or lose it indeed! I might just stick with traditional paper and paints for any future foolish ventures. Incidentally, the coastline is based on a real world location, but with a twist, which intrepid travellers may well recognise.